For some very strange reason a week ago I wasn’t going to the Gloucester v Saracens game; I sat with friends after the Saracens Storm game and listened to their plans, this got me thinking – why on earth am I not going?? Needless to say my ticket for the game was bought by 8am the next morning! The joys of only working 4 days a week meant I set off with time for a leisurely journey, there were only a handful of, I’m in this lane and staying there drivers, so not too much in the way of yelling by me. I listened to the news on what was happening in Paris for most of the journey, having a daughter living there has made the events even harder to listen to. But, bad reception gave me my singing opportunity and the chance to pick a song for the trip – Not too much rubbish this time! Although you may disagree with my choice of best song! Ministry of Sound – Running Trax Mash Up – Touluse/Do You Really Like It – And yes, I shoulder danced and sang the whole way! I can at times go most of the day and not drink – always a certain headache, so I stopped off at the M40 Services for Hot Chocolate – not quite water! And a fruit bread, not quite cake! But very delicious and one of my 5 a day I’m sure! Having had a not so good hotel stay in Leicester I hoped my Premierinn stay would be better, I arrived to find a really nice room. A huge bed, which proved to be very comfortable and full size bath which I of course had to try out when I arrived, and all in all a very tastefully decorated clean room. A good nights sleep is promised and was delivered, all for a mere 36 English Pounds! Credit to Premierinn! I met up with my Saracens friends and we went for a very enjoyable meal, an Indian restaurant that opened early for us. The evening was really odd, early January and largely too warm for a coat! I’m not one for wearing rugby shirts, but I do wear a scarf and a most attractive Saracens bobble hat (is there such a thing) I also tend to carry a flag at away games. 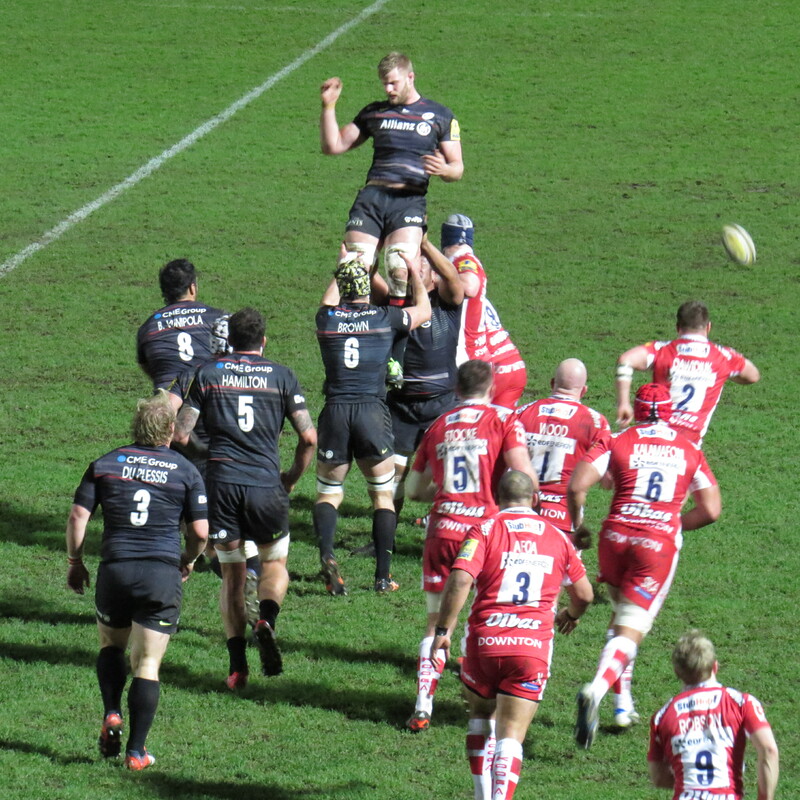 Therefore it is obvious who my team is, that proved to be not such a good thing in the Mira stand at Kingsholm. I came to the same fixture last season and had a lovely afternoon sat amongst season ticket holders in the same stand. They were very gracious in what was a significant defeat. I really wondered what on earth my fellow Saracens fans were talking about when they said Kingsholm wasn’t a nice place to be. I’m afraid that I found out this year, I will say that I was sat next to a very nice Gloucester fan, but I can’t say the same for a few of his fellow fans. From almost minute one several of the men in front of me were shouting abuse at the referee and the Saracens players using language I’ve never heard at a rugby game. And yes, there were children sitting very close to all of this. 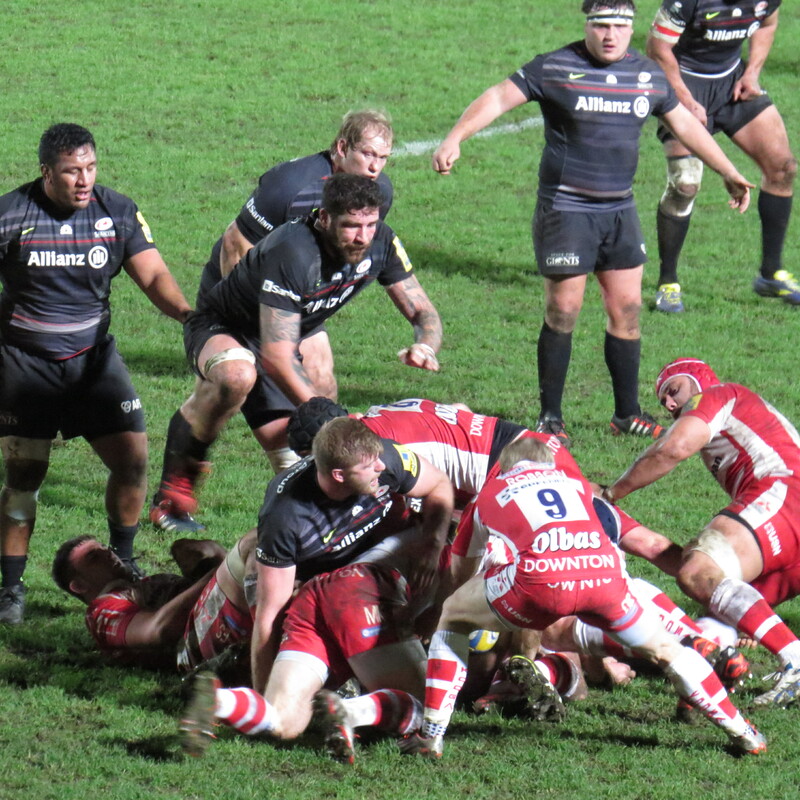 They also felt the need to shout at me and another Saracens fan sat behind me when something they didn’t like happened. I did feel the need to tell one man he hadn’t come in my car and wasn’t actually paid by Saracens either! I was a woman alone and this was rugby but still they felt it ok to direct their venom at me? Not rugby as I know it for sure. A little about the game, I will be writing a match report later – which means I have to watch it all over again – not good! 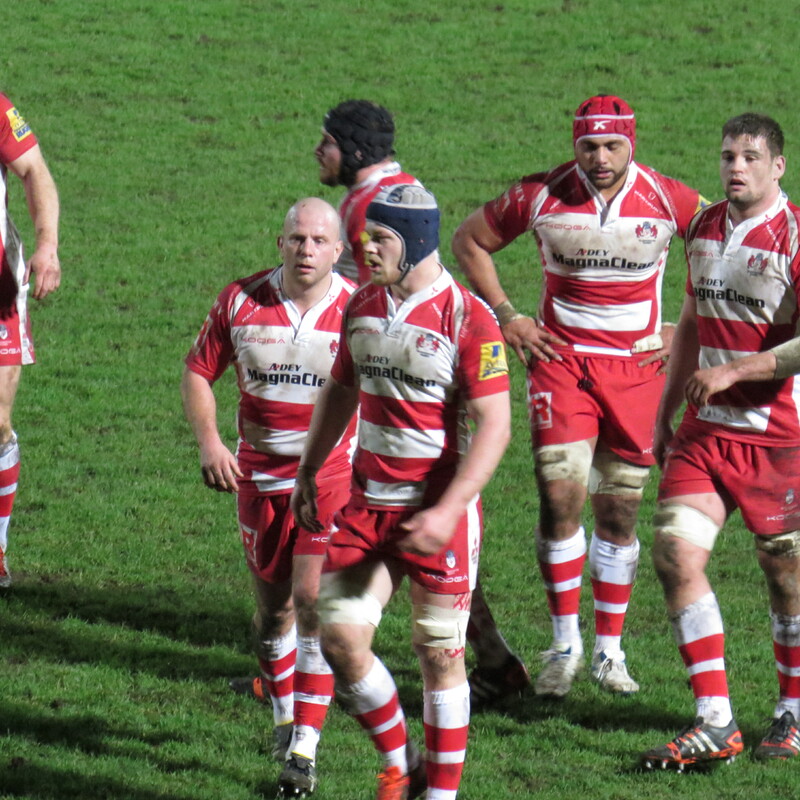 Gloucester will have been keen to show their intent for 2015 and avenge a big loss last season. The referee again was far too big a factor, but I believe the team that won the game was the team that deserved to do so. The people around me were very negative about James Hook, but I was certain he’d score the last gasp kick from the half way line to win the game, I said as much to my pleasant neighbour. And so it was to be, he slotted a great kick over the posts – I’d say that kick was the best moment of the game. 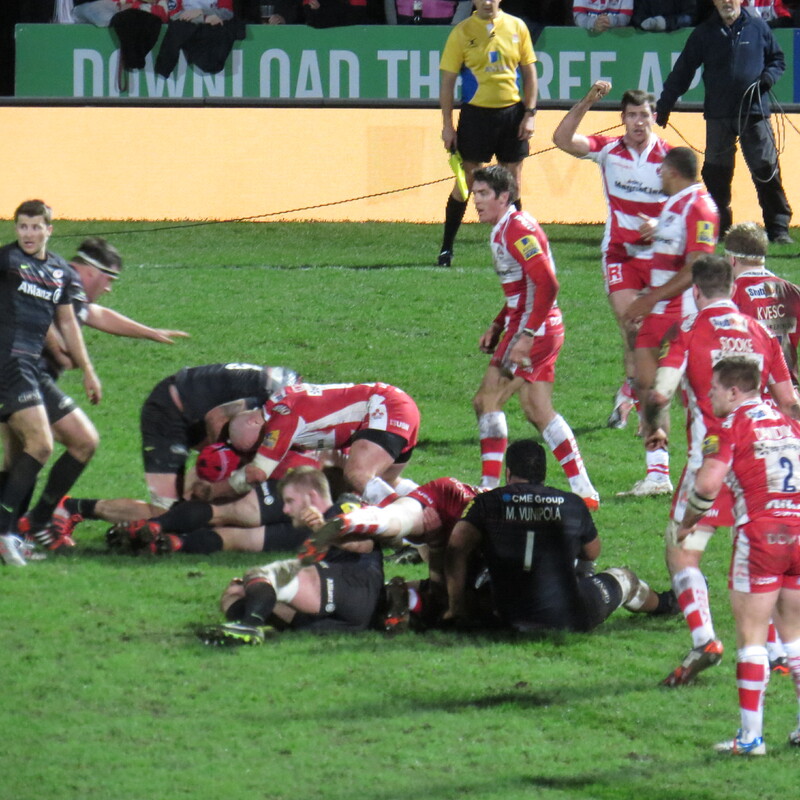 One of the Gloucester Try’s may have been a candidate, it was very exciting, but there were so many missed tackles by Saracens it can’t get the plaudits from me it probably deserved. I also need to add that I did get some shrugged shoulders and smiles from Gloucester fans, I do understand that there are a lot of great fans at Kingsholm. But – to the man who with a very nasty look on his face who said to me – “how can you clap that try?” when it was thought Chris Ashton had scored? I support my team and he plays for them! I also clapped the James Hook kick that beat my team, because it was a great one and a worthy match winner. What a shame that same man didn’t wait to see his team get the deserved win! Safety – again in a big rugby crowd, but for a woman alone it wasn’t pleasant at all being shouted at most of the way through. I’m not sure I’ll repeat the experience as much as I admire both teams. 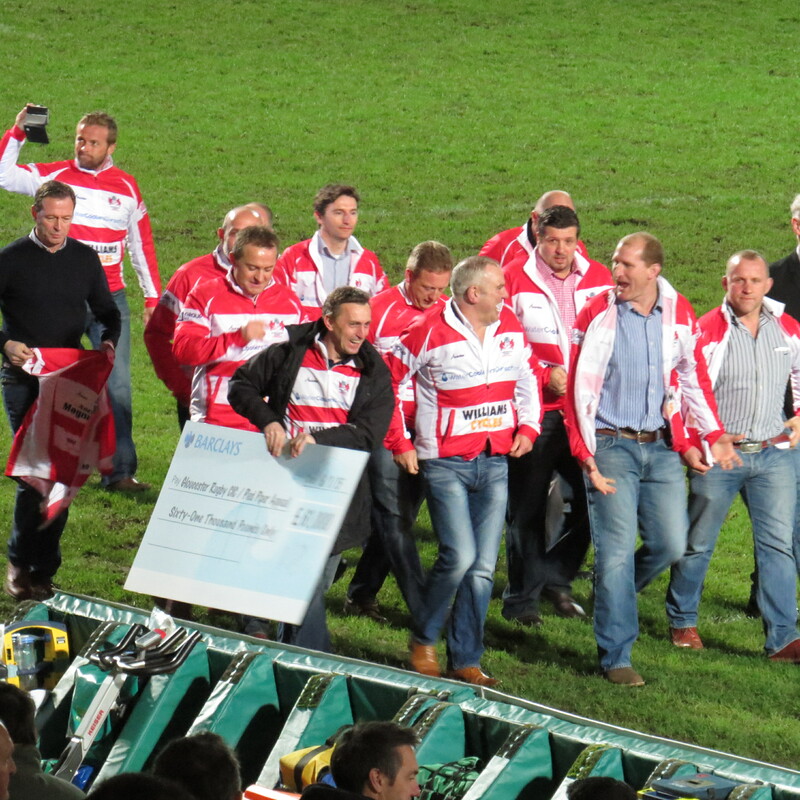 Nicest moment of the day – apart from time with friends, seeing the group of ex players and fans at half time who’d raised a huge £61K for charity with a bike ride. An immense effort! 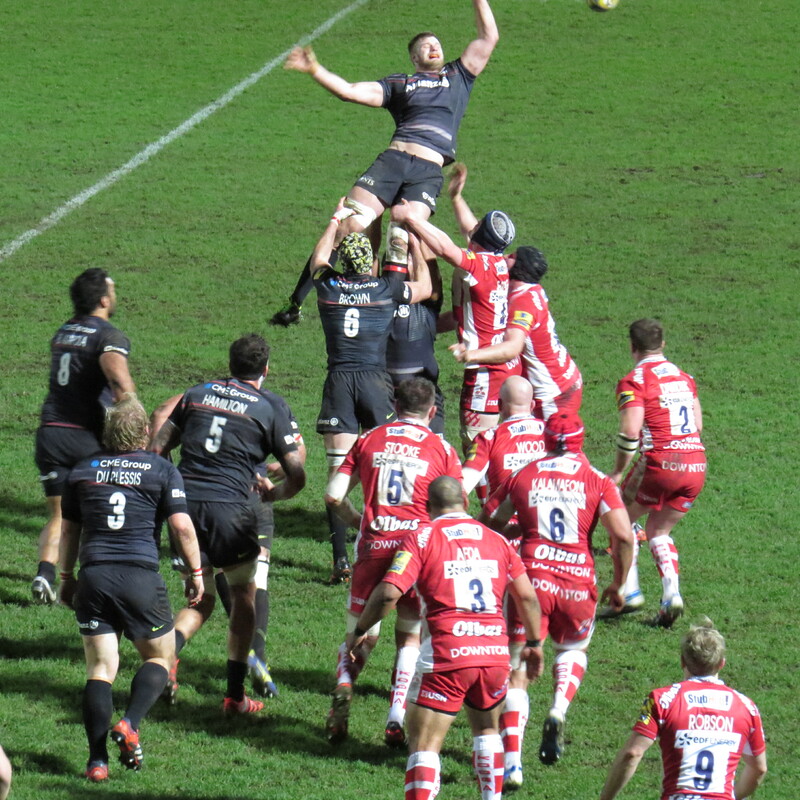 Best moment of the game – odd to say as a Saracens fan – but the James Hook kick to win the game for Gloucester was superb! No journey home after the game, and yes a good nights sleep in a comfortable, quiet hotel I’d recommend it any time a visit to Gloucester is on the cards. Next up? Harlequins v Leicester Tigers – should be great! I great report – really enjoyed reading your match experience. 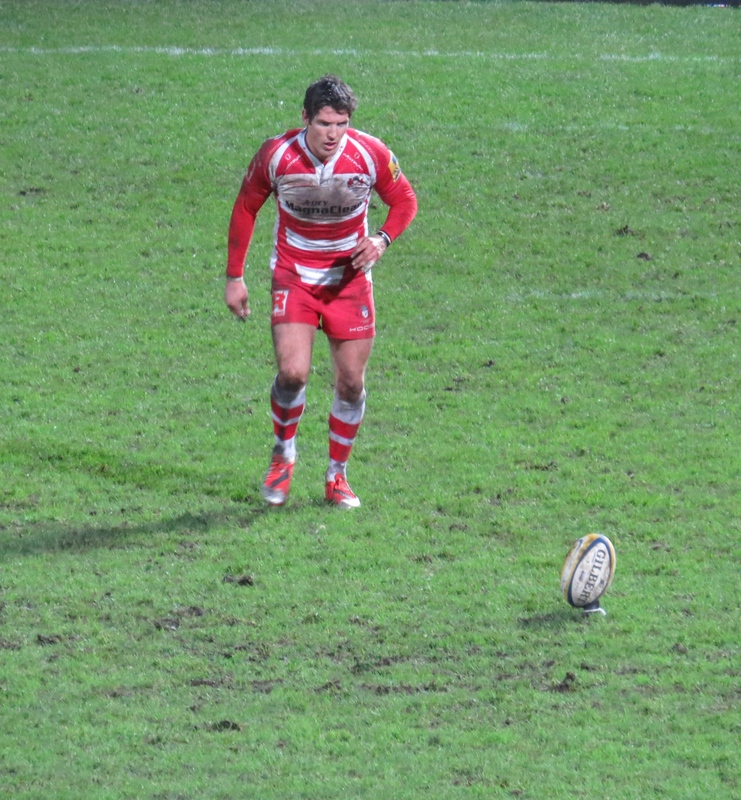 It was a great kick to win the match that James Hook converted. Shame about those fans around you who somewhat spoilt the atmosphere and your enjoyment – shame on them. Sorry to hear of your experience. As a Gloucester fan I had to put up with a similar idiot (Sarries fan) at Allianz park earlier this season. Unfortunately there are always a small minority of people at most venues who behave like this. 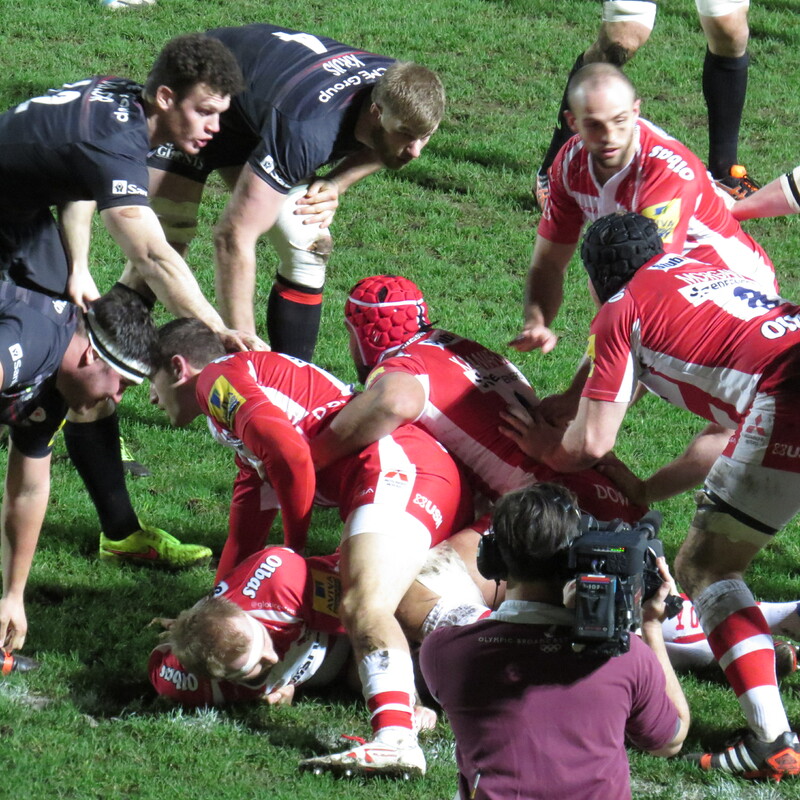 I hope you have a change of heart and return to Kingsholm in future. Thanks Tom, I expect I will, watching sport is what I do, it wasn’t an isolated one man this time there were several around me and 3 other sets of fans experienced something similar. For a lady on her own I’m sure you can imagine it wasn’t very nice at all. I’m sorry you had a bad experience at our place, it’s a very worrying trend, vital to behave like rugby fans not football fans! as a passionate Gloucester supporter (still have no voice from Friday night) I would like to apologise for the way you were treated. There are now too many incidents across the game where fans are not acting the way they should at rugby. Be passionate but respectful. I feel it is time clubs at quickly and hard with name and shame and severe bans to eradicate this behaviour before the worl cup. There’s been a pretty huge response to this blog, I’m thinking about writing an article about the whole situation. Too many seem to be forgetting which game this is. Again I feel very bad for you as I take customers all the time to the Mira from Tigers, Wasps…….. even Bath and have never had a problem. But that said I know it goes on because last year we had to tell some chap to shut up as his language was bad a I had my 7yr old with me. Please except my apologies from the vast majority of Glaws fans and please come again as your write up was excellent and carries more weight when the person is there. Hook will be a crowd favourite after that as we like to beat Saracens but please take that as a compliment as we are a class side. Ha ha, you’re non too shoddy either! Thanks Richard, I felt after the game that I wouldn’t go to Kingsholm again, but I had a great time last season so have to put this down to bad luck. How ironic that I felt safer at West Ham however! I will do that Richard! 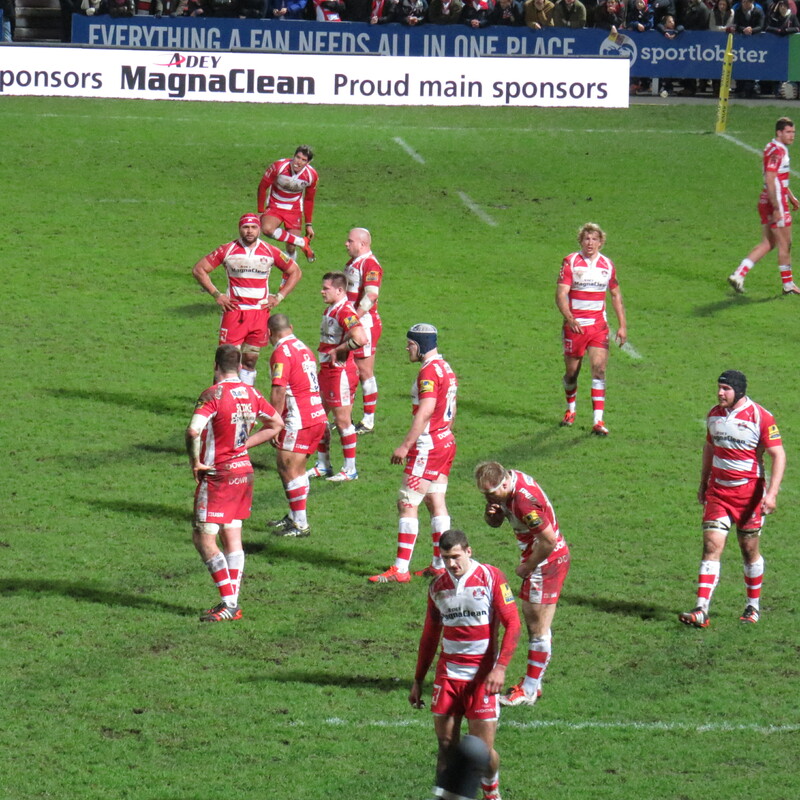 I had a lovely time last season, Gloucester is such a great name in rugby I won’t be able to stay away. It was lovely last season, so i was very surprised! I will be back, there’s way too much great rugby history at Kingsholm for me tp stay away! Well played your boys, they deserved the win! Thanks Nigel, it seems to be drawing a lot of interest. The blog post is an honest representation of how i felt on Friday. I’ve been questioning myself over the weekemd on whether I was right to take my flag. But then I’ve reminded myself this was rugby! Not football! I had a wonderful time amongst lovely people last season, so wasn’t expecting what happened at all! Perhaps discussion is a good thing. Sorry about the ill mannered louts, unfortunately there are too many at all Premiership gounds that I have visited but there is no excuse! Thanks Tim, it is gettkng to ne a worry isn’t it! I hope you found my report to be unbiased, i really do try my best not to be one eyed. That’s a great report, not biased at all, the best team on tbe night won. And oh if only 36 had passed! His decision making is realkt poor at times! Hi Debs, I am a Gloucester lad but live in Hertfordshire now. Went to Allianz Park earlier in the season and had a fantastic day and no idiots just good people and keen rugby followers and all were very friendly to a Gloucester fan in amongst them. Therefore am very sorry to hear of your day at Kingsholm. It is a passionate place and some idiots think the world owes Gloucester Rugby a lot of favours for some reason and blame anyone and everyone if they don’t get them. Please ignore the mindless few and go back next year! Also I expect I’ll be at AP next season so if so would be good to chat about the best sport in the world and debate the match! Great to hear you enjoyed Allianz, the place is really building a good vibe. If you fancy reading more of my blog or reports i’m sure you’ll read some criticism of my fellow Sarries at times, i’m certain that some of them know nothing about rugby! 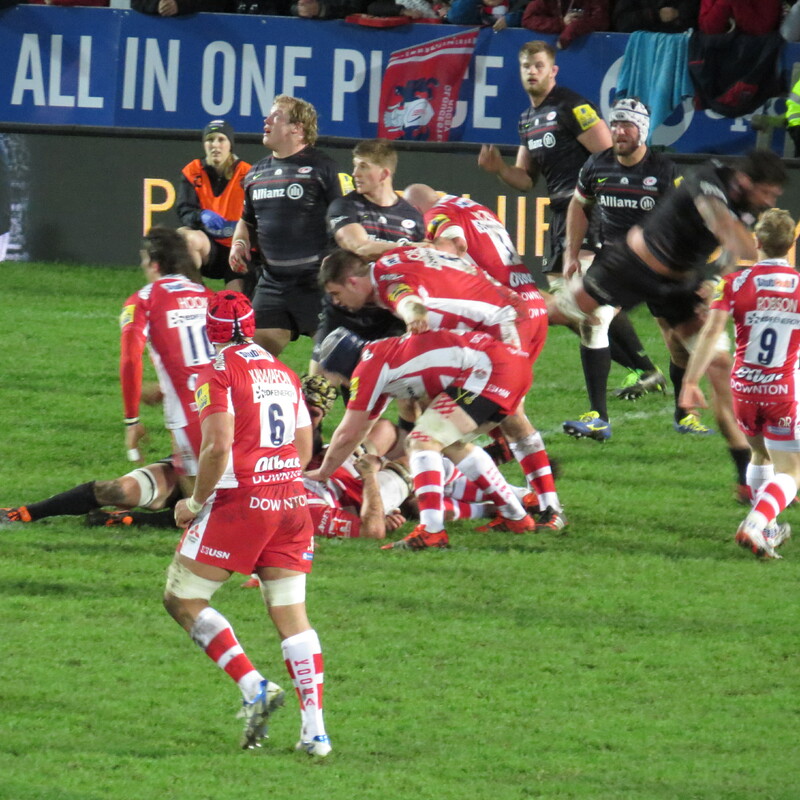 It’d be lovely to meet you when you come to Allianz, and i’m sure i won’t be able to stay away from Kingsholm. Give me a twitter follow if you’re there? Lovely to meet you too! Just going to start my Doncaster piece. Lots of photos, not so many words I suspect. I really enjoyed yesterday!